In the post-credits scene of 2008’s “Iron Man,” Nick Fury (Samuel L. Jackson) teased that Iron Man (Robert Downey Jr.) was “part of a bigger universe.” With that single line of dialogue, the nature of superhero films was changed forever, and the Marvel Cinematic Universe (MCU) was born. Adapting storylines from well-known Marvel comics like “Captain America” and “Thor,” and more obscure plots like “Guardians of the Galaxy” and “Ant-Man,” the MCU has created acclaimed comic book blockbusters connected through Easter eggs, cameos and crossovers. Meanwhile, after “Black Panther” on Feb. 16, Marvel Studios is set to release its highly anticipated 19th and 20th films this year, “Avengers: Infinity War” May 4 and “Ant-Man and the Wasp” July 6. 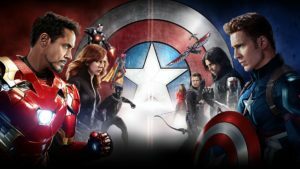 How will these films compare to previous MCU installments? Audiences will find out soon, but for now here is a ranking of the best MCU films so far. Just two months before “Civil War,” D.C.’s “Batman v Superman: Dawn of Justice” featured two brawling superheroes, but Marvel does it miles better. Not only does the film feature unforgettable action sequences (the airport battle is the best of any superhero flick), but it also introduces memorable characters to the MCU with Spider-Man (Tom Holland) and Black Panther (Chadwick Boseman). A film with so many superheroes in a movie could been a mess (see: “Avengers: Age of Ultron”), but instead the film feels balanced, funny and ridiculously entertaining. Before 2014, many didn’t recognize the names Star-Lord, Rocket Raccoon, Drax the Destroyer, Gamora or Groot, but now you’d be hard-pressed to find a superhero fan who doesn’t. “Guardians” made superhero comedies popular and established Chris Pratt as a bona fide star. With thrilling action scenes, a catchy soundtrack, iconic lines (“I am Groot” is a classic catchphrase) and brilliant chemistry between its stars, “Guardians” is not only delightful entertainment, but it also has the heart and wit that many other superhero films lack. Finally seeing “Earth’s Mightiest Heroes” together on the big screen was worth the price of admission to the film alone, but Joss Whedon’s flick still fires on all cylinders. It respects entrenched characters — Thor (Chris Hemsworth), Iron Man, Captain America — seamlessly introduces others — Black Widow, The Hulk (Mark Ruffalo), Hawkeye (Jeremy Renner) — and features the best Marvel cinematic villain in Loki (Tom Hiddleston). The amusing chemistry among the team and several grandiose action set-pieces set a high bar for future team-ups. In “Homecoming,” Tom Holland discards the ghosts of Toby Maguire and Andrew Garfield with his take on the popular character. Unlike his predecessors, Holland brings a refreshing youthfulness and energy to the character. The film is laugh-out-loud funny as it plays with Peter Parker’s double life as both a nerdy high school student and a webslinger. In addition, the Vulture (Michael Keaton) is a layered villain who ranks among the MCU’s best. One cannot make a list of Marvel’s best without including the film that started it all. Robert Downey Jr. resurrected his film career with the role of snarky billionaire weapons dealer Tony Stark, owning the character so much that the actor is now synonymous with Iron Man. The film explores the creation of the armored hero without ever feeling like a traditional origin story, and Downey Jr.’s performance outweighs the fact that the villain, Iron Monger (Jeff Bridges), is forgettable. The film’s revolutionary special effects and world building set the stage for the rest of the MCU. The third Iron Man is not beloved universally because of its unfaithful comic villain, but fans should appreciate the astonishing twist that The Mandarin (Ben Kingsley) is a terrorist figurehead rather than a malevolent villain. “Iron Man 3” works as both a rousing action flick and an effective character piece. A vulnerable Tony Stark is stripped of his treasured suits and forced to rebuild both his armor and his character. Downey Jr.’s performance is his best of the MCU, and his fatherly relationship with the young Harley Keener (Ty Simpkins) adds a new layer to Stark’s character. The action scenes, particularly the plane rescue, are intense and breathtaking. Stark’s technology is pushed to its limits, and it’s electrifying to watch. Benedict Cumberbatch brings the Sorcerer Supreme to the big screen with gusto, giving his all to the role of an arrogant surgeon who loses control of his hands and becomes a magical hero. The film is a conventional origin story that is polished and fascinating, introducing the MCU to the realm of magic and multidimensional travel. While the villain Kaecilius (Mads Mikkelsen) doesn’t bring much to the table, the trippy, supernatural visual effects make the film stand out from the pack. The undisputed best Thor film, “Ragnarok” is the most humorous movie of the MCU. While many of the jokes land, they often detract from the weight of the story, making the film work better as a straight comedy than a superhero flick. Director Taika Waititi defies superhero film conventions to mixed results — he abruptly turns the previously stoic Thor into a comedian, finally gives The Hulk a voice and introduces the hilarious, alcohol-chugging heroine Valkyrie (Tessa Thompson).